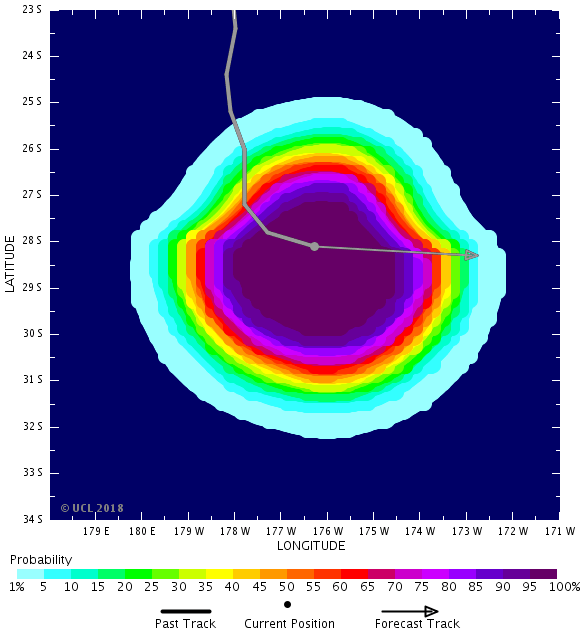 The forecast path shown above is the Nadi’s best estimate of the cyclone’s future movement and intensity. There is always some uncertainty associated with tropical cyclone forecasting and the grey zone indicates the range of likely tracks. 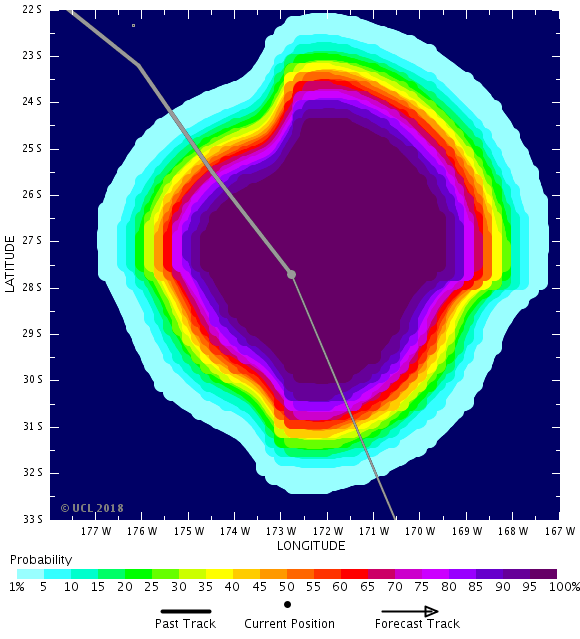 AVERAGE WINDS NEAR THE CENTRE ESTIMATED AT ABOUT 65 KNOTS. AND WITHIN 70 NAUTICAL MILES IN NW QUADRANT. HE NEXT TROPICAL DISTURBANCE ADVISORY ON POLA WILL BE ISSUED AROUND 272000 UTC. A GALE WARNING REMAINS IN FORCE FOR VATOA AND ONO-I-LAU. A HEAVY RAIN WARNING REMAINS IN FORCE FOR LAU AND LOMAIVITI GROUP. MOMENTARY GUSTS TO 100 KM/HR. PERIODS OF HEAVY RAIN AND SQUALLY THUNDERSTORMS. ROUGH SEAS. MODERATE TO HEAVY SWELLS. SHOWERS. MODERATE TO FRESH SOUTHERLY WINDS. 40 KNOTS. ROUGH TO VERY ROUGH SEAS. At3pm this afternoon, TC Pola was located about 200kilometreseast-southeast of Lakeba and 200 kilometres northeast of Ono-i-Lau. TC Polaismovingsouth-southwest at 22km/hr, and should pass close to Ono-i-Lau tonight. On theprojected track, TC Pola is expected to be located about 130 kilometres southeastof Ono-i-Lau at 3am tomorrow and about 300kilometres southof Ono-i-Lau at 3pmtomorrow. For Vatoa andOno-i-Lau: Expect damaging gale force winds with average speeds up to 65 km/hr and momentary gusts to 90km/hr. Periods of heavy rain and squally thunderstorms is expected over these areas. Sea flooding of low-lying coastal areas of Vatoa and Ono-i-Lau due to damaging heavy swells.The effect of winds can cause damages to temporary sheds and weak structures, break tree branches, cause loose objects to fly, and uproot shallow rooted crops. For the rest of the Lau and Lomaiviti Group: Expect fresh to strong southerly winds with speed of 45 to 55 km/hr, gusting to 80 km/hr. Periods of rain, heavy at times and a few thunderstorms is anticipated over these areas. Mariners can expect gale force winds up to 45 knots, gusting to 65 knots with high seas. Conditions are unsafe for sea activities.Operating a vessel in gale conditions requires experience and properly equippedvessels.For Koro Sea and Northern Lau Waters: Expect southerly winds of 20 to 30 knots, gusting to 40 knots with rough to very rough seas. Small craft operators are advised to exercise caution while venturing out into these waters. Green Alert (Low) is TS to between 31% and 50% probability. HURRICANE WARNING 151 ISSUED FROM RSMC NADI Feb 271307 UTC. REPEAT POSITION 20.4S 177.8W at 271200 UTC. CYCLONE MOVING SOUTHWEST AT 10 KNOTS. CYCLONE INTENSIFYING. AND NEAR 23.5S 178.9W AT 281200 UTC. THIS WARNING CANCELS AND REPLACES WARNING 150. Do not use any information on this site for life or death decisions. All information is intended as supplementary to official sources. Kindly refer to your country’s official weather agency/government website for local warnings, advisories and bulletins. Mean winds 64-85 knots with a central pressure 970-945 hPa currently (Fiji Intensity Category 3) = approx equivent to a CATEGORY 2 Hurricane on the Saffir-Simpson Hurricane Wind Scale. A HURRICANE WARNING REMAINS IN FORCE FOR ONO-I-LAU. 101500Z POSITION NEAR 22.1S 177.6W. 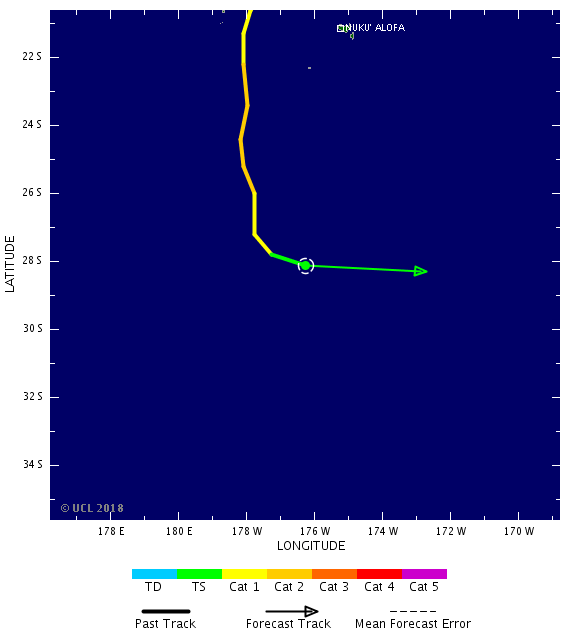 WINDS NEAR THE CENTRE ESTIMATED AT ABOUT 65 KNOTS. AND WITHIN 110 NAUTICAL MILES IN NW QUADRANT. BE ISSUED AROUND 101400 UTC. A STRONG WIND WARNING REMAINS IN FORCE FOR THE REST OF FIJI. ISLANDS, LAU AND LOMAIVIT GROUP AND IS NOW CANCELLED FOR THE REST OF FIJI. KM/HR. SEVERE TROPICAL CYCLONE KENI MOVING EAST-SOUTHEAST AT ABOUT 45 KM/HR. OF ONO-I-LAU AT 11:00 pm TOMORROW. PERIODS OF HEAVY RAIN AND SQUALLY THUNDERSTORMS. FLOODING, INCLUDING SEA FLOODING OF LOW LYING AREAS. WINDS GRADUALLY EASING FROM EARLY TOMORROW MORNING. SHOWERS, POSSIBLY HEAVY AT TIMES OVER ELSEWHERE. FLOODING, INCLUDING SEA FLOODING OF LOW LYING AREAS LIKELY. ISSUED AROUND 2:00 AM TOMORROW MORNING OR EARLIER. – Cyclone name has been changed from #CycloneKala / #Kala to #CycloneKeni / #Keni. NOT CLEAR why the last minute change today. HURRICANE WARNING 032 ISSUED FROM RSMC NADI Apr 101254 UTC. REPEAT POSITION 20.9S 179.0W AT 101200 UTC. CYCLONE MOVING SOUTHEAST AT ABOUT 22 KNOTS. EXPECT SUSTAINED WINDS OF 75 KNOTS CLOSE TO THE CENTRE. AND WITHIN 100 NAUTICAL MILES IN W SEMICIRCLE. AND NEAR 30.8S 171.2W AT 111200 UTC. THIS WARNING CANCELS AND REPLACES WARNING 031. STORM WARNING 027 ISSUED FROM RSMC NADI Apr 091322 UTC. SOUTH 173.6 EAST AT 091200 UTC. REPEAT POSITION 17.3S 173.6E AT 091200 UTC. CYCLONE MOVING EAST SOUTHEAST AT 10 KNOTS. CYCLONE INTENSIFYING. 65 KNOTS BY 110000 UTC. AND NEAR 20.1S 179.6E AT 101200 UTC. THIS WARNING CANCELS AND REPLACES WARNING 026. AVERAGE WINDS NEAR THE CENTRE ESTIMATED AT ABOUT 50 KNOTS. EXPECT WINDS OVER 47 KNOTS WITHIN 40 NAUTICAL MILES OF CENTRE. AND WITHIN 100 NAUTICAL MILES IN NW QUADRANT. LLCC. ORGANISATION HAS IMPROVED IN THE PAST 24 HOURS. OUTFLOW GOOD. BASED ON 0.95 WRAP YEILDS DT=3.5, MET AND PT AGREE. FT BASED ON DT. 152100Z POSITION NEAR 14.6S 166.4W. 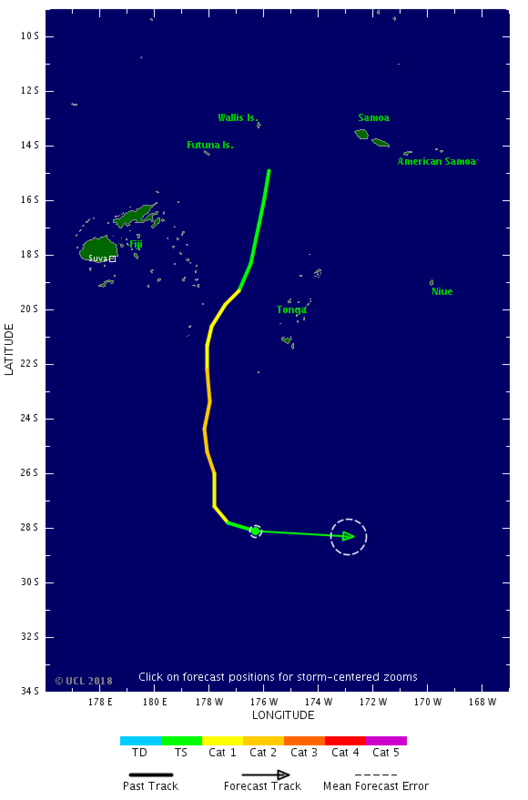 PAGO PAGO, HAS TRACKED WESTWARD AT 02 KNOTS OVER THE PAST SIX HOURS. STORM WARNING 072 ISSUED FROM RSMC NADI Jan 151938 UTC. 14.7 SOUTH 166.8 WEST AT 151800 UTC. REPEAT POSITION 14.7S 166.8W AT 151800 UTC. CYCLONE MOVING WEST-SOUTHWEST AT 05 KNOTS. CYCLONE INTENSIFYING. 60 KNOTS BY 160000 UTC. AND NEAR 15.6S 166.7W AT 161800 UTC. THIS WARNING CANCELS AND REPLACES WARNING 070. SUSTAINED WINDS OF 100 KNOTS CLOSE TO THE CENTRE. PERSISTENT WITH SLIGHT WARMING IN CLOUD TOPS PAST 6 HOURS. ORGANISATION REMAINS GOOD. OUTFLOW GOOD. SST AROUND 27 DEGREES. BASED ON DT. THUS YIELDING T5.0/6.0/W0.5/24HRS. Tropical Cyclone Warning Number 14 for Anietyum Island, TAFEA province. south of Aneityum and 285 KM south southeast of Tanna. 14 KM/HR in the past 3 hours. 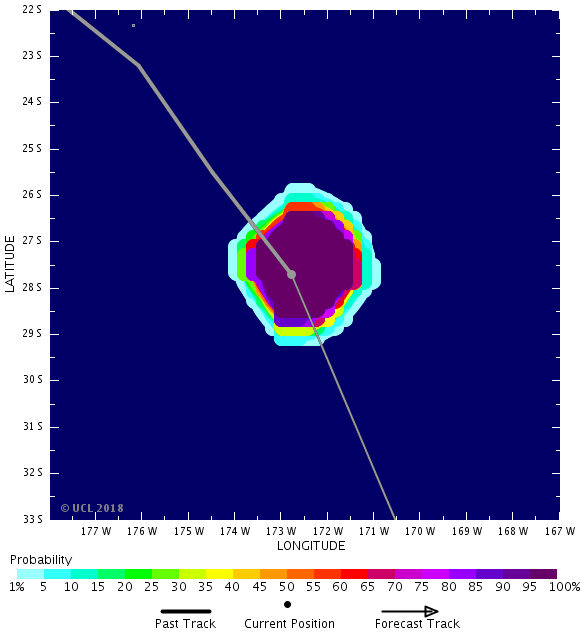 Winds close to the center are estimated at 165 KM/HR. 23.7 degrees South 170.1 degrees East. 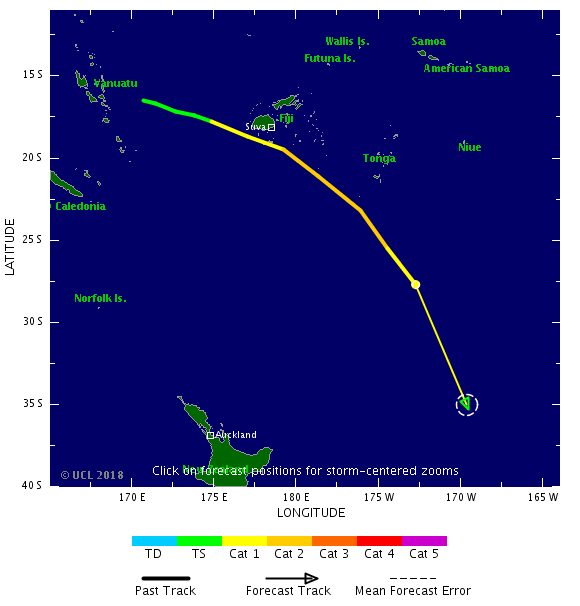 Ula continues a southward movement away from Vanuatu Area. 6:08am VUT Monday 11 January 2016.
i bin muv lo south southwest dareksen lo wan spid blo 14 KM/HR lo las 3 aoa we i pas. 23.7 degrees South 170.1 degrees East lo nekis 06 kasem 12 aoa. Ula i kontinu blo muv aot lo eria blo Vanuatu. Bae i no mo kat narafala woning we ba i kamaot. 102100Z POSITION NEAR 22.6S 170.1E. HURRICANE WARNING 047 ISSUED FROM RSMC NADI Jan 101900 UTC. REPEAT POSITION 22.0S 170.1E at 101800 UTC. CYCLONE MOVING SOUTH-SOUTHWEST AT 09 KNOTS. CYCLONE WEAKENING. AND NEAR 26.5S 171.1E AT 111800 UTC. A HURRICANE WARNING REMAINS IN FORCE FOR THE VA�VAU GROUP AND HA�APAI GROUP. A GALE WARNING REMAINS IN FORCE FOR THE TONGATAPU GROUP. A STRONG WIND WARNING REMAINS IN FORCE FOR THE REST OF TONGA. Jan 10/1940 UTC 2014 UTC. NEAR THE CENTRE ESTIMATED AT ABOUT 105 KNOTS. ABOVE 33 KNOTS WITHIN 60 NAUTICAL MILES OF CENTRE. WILL BE ISSUED AROUND 110200 UTC. Jan 10/1959 UTC 2014 UTC. AREAS. PHENOMENAL SEAS. DAMAGING HEAVY SWELLS. AREAS. HIGH SEAS. DAMAGING HEAVY SWELLS. 102100Z POSITION NEAR 19.3S 174.6W. HURRICANE WARNING 024 ISSUED FROM RSMC NADI Jan 10/1857 UTC 2014 UTC. 174.7 WEST AT 101800 UTC. REPEAT POSITION 18.8S 174.7W AT 101800 UTC. CYCLONE MOVING SOUTH-SOUTHEAST AT 6 KNOTS. CYCLONE WEAKENING. ������������ OVER 33 KNOTS WITHIN 60 NAUTICAL MILES OF CENTRE. ������������� AND NEAR 21.6S 173.7W AT 111800 UTC. THIS WARNING CANCELS AND REPLACES WARNING 023. A STRONG WIND WARNING REMAINS IN FORCE FOR VATU-I-RA PASSAGE, KORO SEA AND LAU WATERS . 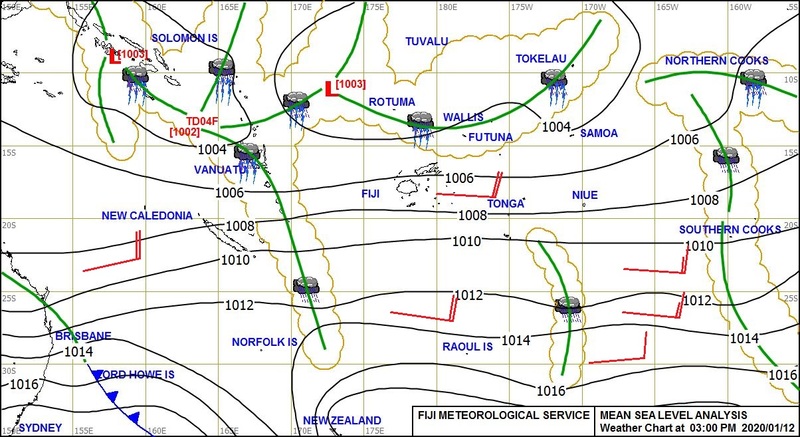 Situation: A fresh to strong southerly wind flow prevails over Fiji waters. Forecast to midday tomorrow for Fiji waters: For Vatu-i-ra passage, Koro Sea and Lau Waters: South to southeast winds 20 to 25 knots. Rough seas. Moderate to heavy southerly swells. Further outlook: Southerly winds 15 to 20 knots. Moderate to rough seas. Moderate southerly swells. For the rest of Fiji waters: South to southeast winds 15 to 20 knots. Moderate to rough seas. Moderate southerly swells. Further outlook: Southerly winds 15 to 20 knots. Moderate to rough seas. A tsunami has struck the eastern Solomon Islands after a powerful earthquake that briefly triggered warnings for several South Pacific nations. The magnitude 8.0 quake near the Santa Cruz Islands is reported to have destroyed at least three villages. Officials in the Solomon Islands say there may be casualties. The U.S. Geological Survey says a tsunami measuring 0.9 meters hit the town of Lata in the Santa Cruz Island chain in the eastern part of the Solomon Islands. Officials say the wave swept half a kilometer inland, destroying homes and sending panicked residents fleeing to higher ground. Solomon Islands Police Commissioner John Lansley says authorities are trying to establish how much damage the tsunami has caused. “We believe that three, possibly four villages have been affected,” said Lansley. Aid workers struggled to reach remote, tsunami-ravaged villages in the Solomon Islands on Thursday, as the death toll rose with more bodies found in wrecked homes and debris in the South Pacific island chain. At least nine people, including a child, were killed when a powerful earthquake set off a small tsunami that sent 4 foot, 11-inch waves roaring inland on Santa Cruz Island, in the eastern Solomons, on Wednesday. Around 100 homes across five villages were damaged or destroyed. The waves proved deadly for five elderly villagers and a child who weren’t fast enough to outrun the rushing water, said George Herming, a spokesman for the prime minister. Three more bodies were found Thursday, but Herming said details of how those victims died were not immediately available. Several others are missing and dozens of strong aftershocks were keeping frightened villagers from returning to the coast, Herming said. “People are still scared of going back to their homes because there’s nothing left, so they are residing in temporary shelters on higher ground,” Herming said. The tsunami was generated by an 8.0-magnitude earthquake that struck near the town of Lata, on Santa Cruz in Temotu, the easternmost province in the Solomons. Disaster officials were en route to the isolated area Thursday after the local airport, which was flooded by the tsunami, was finally cleared of debris. “Homes were damaged and at least five people have been reported dead after a tsunami triggered by an undersea earthquake hit the Solomon Islands. The quake, with a magnitude 8.0, struck at 01:12 GMT near the Santa Cruz islands, the US Geological Survey said. A tsunami measuring 0.9m (3ft) then hit Lata on eastern Santa Cruz island, swamping the island’s airport. A tsunami warning was triggered for several Pacific nations, but was cancelled about two hours later. Lata is the main town on Santa Cruz, also known as Nendo. It is the largest island in the Santa Cruz island chain, part of the Solomon Islands nation. The worst of the damage was said to have been on the western coast of Santa Cruz, with one report putting the waves there at 1.5m. Medical staff at Lata hospital said five people had been killed – four elderly people and one young boy. But director of nursing Augustine Pilve told New Zealand television that number could rise. “It’s more likely that other villages along the coast of Santa Cruz may be affected,” he said. 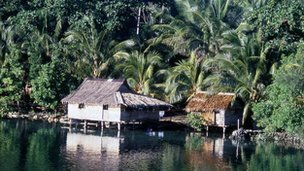 Robert Iroga, press secretary to the Solomons prime minister, told the BBC that the waves west of Lata had travelled some 500m inland, and that three villages had been damaged. Many of the homes in the area were semi-permanent, he said, and were reported to have been flattened. Police were travelling to the area, he said, and the priority was to ensure the local airport is functioning so aid and supplies can be flown in. Another government spokesman, George Herming, said reports suggested that between 60 to 70 homes have been damaged in four villages on Santa Cruz Islands. “At this stage, authorities are still trying to establish the exact number and extent of damage,” he told AFP, adding that communications with the islands was difficult because of their remoteness. Initial reports by the USGS said the quake had a shallow depth of 5.8km (3.6 miles) but it later revised the figure to 28.7km (17.8 miles). Luke Taula, a fisheries officer in Lata, told Reuters news agency the wave came as several small tidal surges. “We have small waves come in, then go out again, then come back in. The waves have reached the airport terminal,” he told the news agency. 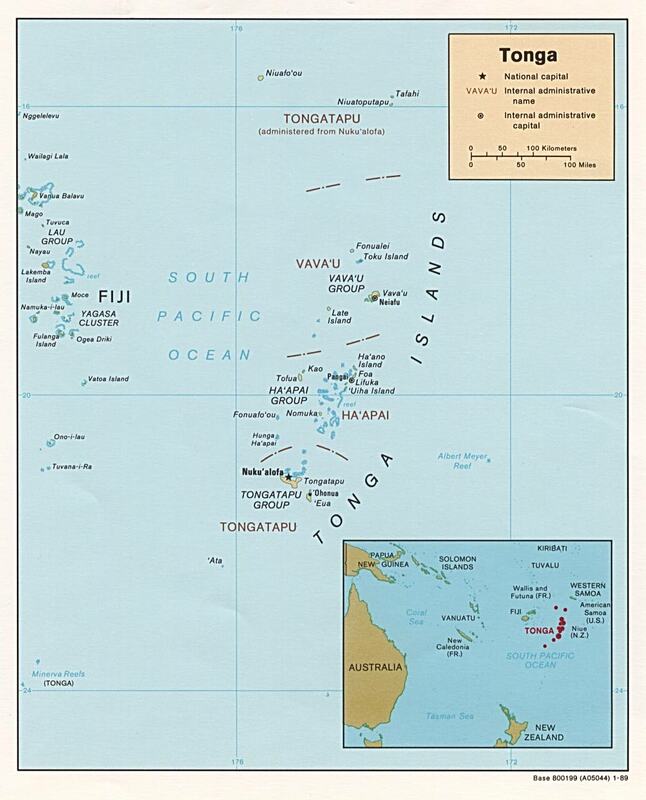 Tsunami warnings were issued for the Solomon Islands, Vanuatu, Nauru, Papua New Guinea, Tuvalu, New Caledonia, Kosrae, Fiji, Kiribati, and Wallis and Futuna islands. But they were later cancelled. by the Pacific Tsunami Warning Center, which warned that some coastal areas may still experience small changes in sea level. The Solomon Islands form part of the Ring Of Fire, a zone of volcanic arcs and oceanic trenches encircling the Pacific basin. The 8.0 earthquake was followed by several aftershocks, the largest measuring 6.6 magnitude. The region has been experiencing a series of smaller quakes in recent days.